Back in 2011, there was similarly not much sense that Apple would be able to regularly develop new technologies that would keep bringing buyers back for more iPhones and iPads. 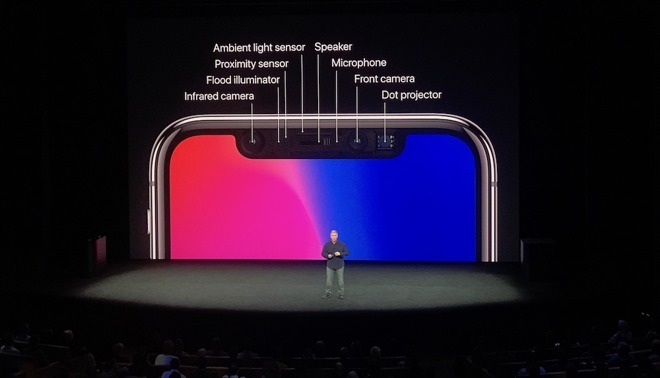 Yet Apple successfully identified technologies such as Siri, Touch ID, its 64-bit A7, advanced graphics, Apple Pay-- resurrecting the fingerprint security that Android had abandoned-- and most recently Face ID with Animoji and Selfie Portrait photography. 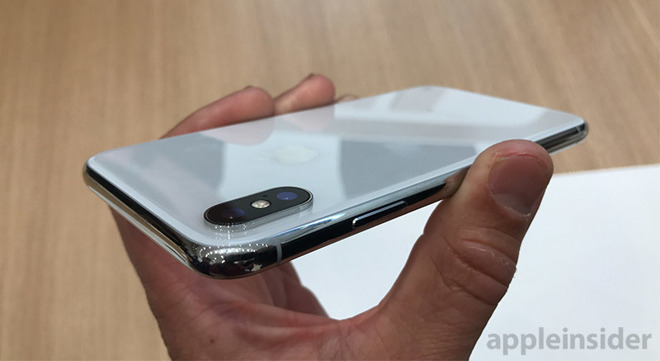 iPhone consistently remained the top-selling smartphone even as The Verge and other outlets hailed every new Android as being the best smartphone ever. In parallel, concern pundits regularly admitted they had no idea how Apple might ever innovate its way out of what they imagined to be an impossible quandary of being so far behind the rest of the industry-- as Kara Swisher recently did for the New York Times. That didn't stop Apple from innovating and remaining in first place globally as the largest shipper of premium phones and vastly more profitable than everyone else put together. In areas where Android licensees did pioneer not-quite-ready technologies such as fingerprint sensors, NFC, OLED, 4G, and large displays, they were unable to hold on to their initial flickers of interest among consumers. Their potential was quashed as soon as Apple arrived -- fashionably late -- and delivered a better version of what they had prematurely thrown out into the market at too high of a price, with too little thought, marginal quality, glaring security issues, and significant drawbacks in terms of size, weight, usability, and appearance. Smartphones hardware has outpaced software innovation by a significant degree. Version 12 of iOS was a “stability” release. Will v13 be innovative? My biggest reason with staying with Apple is iMessage... that’s not good. Wow! Dan, I usually find your articles quite brilliant but your "communism" "capitalism" analogy is really off the mark. If you don't think that big corporations practice a form of get in line and think like the "fearless leader" than you haven't been paying attention. Nowhere is conformity stressed and called a "culture" than in the corporate world and nothing says capitalism like corporations. Apple is just another big corporation with the same goals as all the others to sell products and services and make a profit for it's share holders. Many agree it does it better than most with a great blend of style, technology and marketing. I am puzzled why the media pundits constantly quoted on AI, as if Apple haters would visit this site to begin with. We know the pundits predictions will be wrong and often comically wrong. Dan please don't mix political ideologies in your articles, you do realize that most of your readers have little idea to what the differences are between socialism and communism never mind the shades and varieties of them since most of them are Libertarian judging by their comments don't challenge them or yourself this much. quote: “The only real threat that Apple actually faces is the prospect of no longer viewing any competitors as a real threat that it needs to outmaneuver with better products…” I do not think that Apple’s innovation is fueled by competition (alone). As Steve Jobs said, Apple is there to make the best products for consumers. This alone —at least for me— is enough reason for Apple to keep innovating indefinitely. Health and privacy/security are two compelling pluses for Apple's "capitalist" future. Differentiation in personal or enterprise productivity will determine whether it can grow again in surveillance states like China. On the bear side, further price increases of HW and market share gains may be tougher in mature markets like US. Apple still essentially impotent in India, Brasil, etc. Not surprising the push into subscriptions and original media. I hope DED opines on such topics in future. Saying that Android Pay is problematic is quite ignorant. All Europe has been using it for years now while Apple Pay news enphasize success of indiviual implementation by some banks and some vendors to match Android Pay. This argument may apply more to Android Auto vs. Apple CarPlay as adoptin for Apple CarPlay seems to be bigger, but not by far. Both companies innovate based on both OS'es, but one is less incremental than the other. Also Apple is not genuine innovator on many of features because they showed with Android earlier and that is fact Apple crowd seems to hgave hard time to recognize. What Apple achieved however is that it came up with far more polished solutions anf frequently of the same type. Sure it innovated in many aspects, but it was not unique to Apple only and some being entrenched in Apple iOS missed what was happening on the other side. 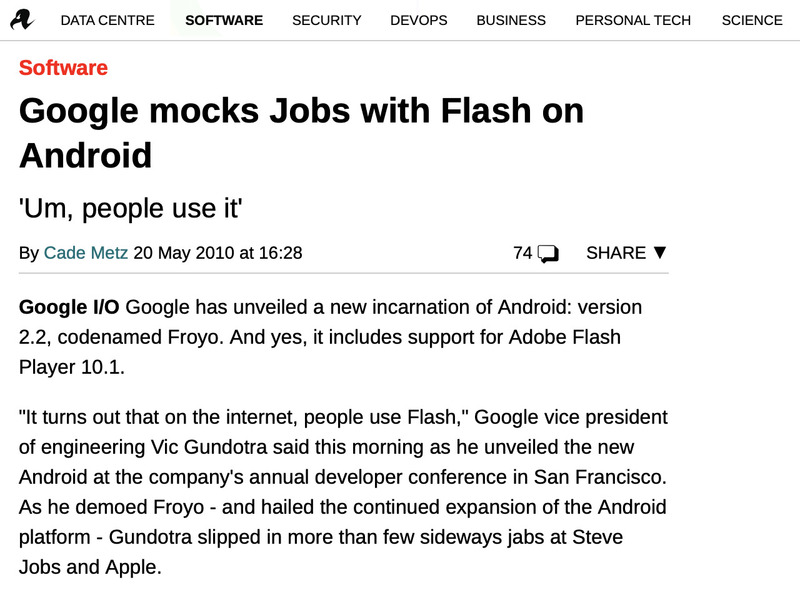 For the record we are in of Android 8.x (Oreo) and soon Android 9.x (Pie) so mentioning Android 2.x from 9 years ago is pointless. The reason why "Android fans are willing to spend more on new Android devices than on expensive Apple" may be because what Samsung (and Huawei just day after Samsung) did with those expensive (and seems somewhat impractical) screens is actual innovation that Apple did not come up with as it may consider this risky (just like LG that announced day before Samsung unveiled new solution they it will let Samsung to make mistakes first). There are fan clubs that may be pereceived brainwashed on both sides: Apple and Android, but generalizing and referring to Android fans while those are more Samsung fans is incorrect. Android base is much bigger than Samsung and far bigger than Apple iOS (I refer to world marketshare - not just US that is rather small piece of big cake). That so many are coming out with "fold fons" at same time. Isnt that phony innovation? Not quite right. While all corporations aim to be profitable since profit is the air corporations breathe, they can choose to do so in different ways. Some corporations manage to their stock price, to focus on maximizing shareholder value. In others, management chooses to focus on delighting the customer, not the stock price. This is a significant difference. Apple under Steve Jobs picked a handful of trends and technologies and then polished them into a smooth and usually seamless implementation, but were rarely the first to announce or deploy. Apple under Tim Cook has looked more than a little like Microsoft under Steve Ballmer- iteration and imitation instead of innovation and new technologies rushed to market before they were ready for prime time. Apple is behind in more than a few things, but if all you ever use is Mac OS, iOS, TV OS, etc, you might not know. Not evangelizing for Android, Windows or LINUX, but simply stating fact. My Surface Pro (6 gen) is in many ways superior to the MacBook Pro it replaced- it boots way faster than any Apple laptop and faster than my late 2018 Mac mini and this while supporting both facial recognition and fingerprint login. The UI rarely exhibits behaviors sometimes seen on Apple’s SW where the web feeds some of the “desktop” interface even on fast networks. Pen input is superior than on iOS and far better priced. The keyboard cover has illuminated keys- unlike the iPad Pro I am typing on right now. Search on the Surface is better than the jacked up mess on the Mac since Web search was mixed into the OS search function. There are many other points. Away from any specific OS, Apple’s voice recognition technology is way behind not only what Amazon offers, but even what Blackberry QNX that runs many automotive voice systems. The built in QNX voice recognition is far better at taking voice input and accurately understanding what is being said than Apple’s. Apple Maps is still inferior to other products & the traffic routing is just wrong more often than right in many urban areas. The database is also out of date in many parts of the country. HomeKit still is not ready for serious use - as in critical systems control - and is inconsistent across Apple SW platforms. On the HW side in desktops and laptops, Apple is charging high prices for what is often chipsets a generation behind what is currently available. Otherwise 2020 prices for 2018 HW. They also continue to abandon connectivity without having a solid, consistent and reliable replacement ready to go. The hot mess that is USB C and Lightning interoperability and compatibility is a real issue on both iPad Pros and Mac laptops. The Apple of today is in many ways an inverted version of the one presided over by Steve Jobs. It just works is not always the order of the day nor is best in class performance or high value for high price. Apple HW has always been expensive, but it used to always be able to justify the price. I agree with your criticism of charging more for older intel chips.I blame that majorly on Intel. Other than that you are just full of it. Apple clearly states why you need usb c on PRO devices.On consumer devices like iPad & iPhone & accessories lightning is king. The Mac is clearly for people with legacy workflows & developers. Wow! Dan, I usually find your articles quite brilliant but your "communism" "capitalism" analogy is really off the mark. 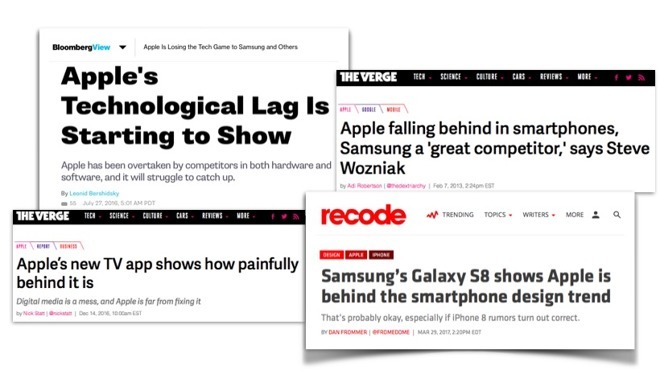 I interpreted those references as mostly a dig at the current fad for people claiming Chinese tech companies are innovating faster than Apple now that Samsung has largely fallen by the wayside as a major competitor. Get triggered much? Your faith in your perception of the world is.. admirable? Seems like a fairly apt analogy to me. Both are systems guided by feckless ideologues where merit is determined by devotion to ideology, which is a bad way to run any system. It's a shame to diminish Apple's clear devotion to not just being a successful company, but to also being a socially responsible one, which I admire tremendously, even though Apple sometimes overlaps a bit with the SJW crowd (which is beyond obnoxious). Apple is an amazing example of capitalism done right. I agree that Apple's doing just fine with their sales, and that their push into services is a natural progression as they approach a certain threshold. My worry about Apple is that they're historically so so terrible at services and even the basics of social. Take Apple Muisc for example, 3 years out, it's the app with the most social potential, and yet all you can do is post a profile pic and share playlists (that you can't even write personal comments about). Pathetically inept. I wish Apple would do a huge push for privacy, with long form commercials, newspapers, series of youtube videos, etc. It would not only convey that Apple is a principled company, and educate people about the advanced technology in their products (facetime, secure enclave, full disk encryption, etc) but also educate people on one of the principal reasons why Apple hardware is superior. Apple execs can talk about privacy till they're blue in the face, but if they don't create a campaign that explains it extremely clearly, they will continue to be able to be brushed aside as comparable to all the others, "they all spy on you," "they all track you," "they all say they care about privacy." 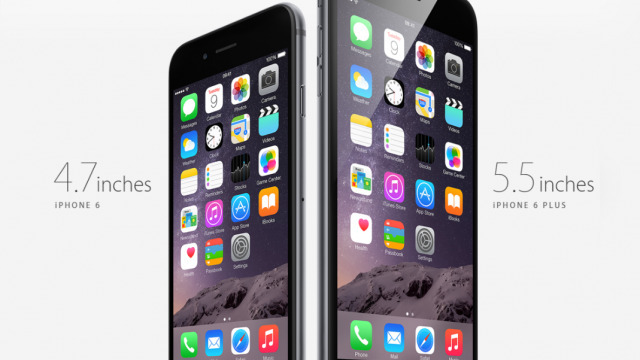 It's not even disputable that nowadays, on the hardware side, others have the same or even better devices than Apple. The only thing that makes Apple shine imo, is the ios and macos. Android or Windows are just cumbersome and ugly. Now Apple should really concentrate on its software and try to bring useful (not a poop emoji), innovative ideas to ios 13. And it should also lower its premium iphones. Yeah, I found myself saying "wtf?" to the whole communist section too. Every hardware manufacturer (including Apple) is taking advantage of the manufacturing cost savings from China, which are mainly due to cheap labour in certain areas of the country combined with technology manufacturing expertise and lax environmental laws. Those manufacturing conditions are similar to a number of other non-Communist countries in the world (aside from the technology manufacturing expertise). For example, manufacturing clothing in Bangladesh. To frame Apple as championing Capitalism while everyone else is championing Communism is really confused. Ignorant nonsense - as you ought to know, emoji is a unicode character set ratified by a committee, and it’s then implement by each vendor. Apple having graphic designers creating images for the characters has zero bearing on hardware design. Your opening statement is bogus as well. It’s certainly disputable. Well, according to Jobs and Apple, it's not the labor cost that keeps them in China, it's the entire industry of component manufacturing -- it's all in Asia. So it makes less sense to ship it all back elsewhere to assemble. That and their willingness/ability to ramp up lines quickly and around the clock. Yeah, that's why I mentioned technology manufacturing expertise in the same breath, something which is unique to China (and nearby areas) compared to other areas of the world (and which the US is lacking). But yeah, the main point was the fact that it's really not about Capitalism vs Communism at all. Foxconn/Hon Hai has manufacturing employee expertise and many phone and computer manufacturing plants in Mexico, Brazil, Eastern Europe, etc. so that's not unique to China or Asia. But according to Jobs and Apple the labor rate is not a factor at all, it’s the component infra. For a rumours site this article contains zero speculation about the future.